My Time for a template peek! To start-Many of you always ask about Alexa (thank you!) she had a great appointment, things are good, and Amber’s Christmas recital went great too. OK let the My Timeless Template excitement begin! I am so over the moon with this template. PLEASE NOTE: The template shared today will not be available for download until the 15th. If you are new to this whole template thing-read this. Got some questions? Maybe they are answered here. Also you can email me anytime at anr5@verizon.net for any questions you may have as well. Want to see some samples with the past templates go HERE, and don’t forget each download has an exclusive full color idea booklet with supplies/instructions. First I really, from the bitty bottom of my heart-want to say thank you to all of you who have purchased/used my past templates! I can’t tell you how great it feels to see that, and I love hearing your feedback 😀 Because of that we are including general instructions for assembly with the templates, and (for some) if needed, photos for some of the steps, if it sounds like it is confusing. If you missed it Julie Campbell wrote a super sweet critique on the My Timeless Template line HERE! I’m still in awe over it! I think it also helps reading reviews of “customers” not my, the creator, who of course loves what I do. Today I will get to share my first of several peeks. Now, like ALL my templates, it starts with a concept, and a catchy title, but each template can be much more versatile than the given name! So don’t get hung up on the “name”! Just sit back and watch all that can be done with each template (outside its given title) as the days progress. Well its about that time of year when you give homemade treats, or like to package up some goodies in a fun new way! It’s not too late to use these templates for the holidays either. Now don’t just think holidays! Think-any occasion. The friend who is sick, someone did something nice for you, someone had a baby, a birthday, surgery………you name it. Maybe there is NO reason. I love presenting simple things in a fun, creative way. I say this repeatedly but, it really IS all about the PRESENTATION!! Oh and our time. That too is precious. My idea is based on the concept for you to maximize creative time !! Now speaking of easy, and home made, I often make home-made chocolate lollipops (I loathe cooking so these are so up my alley) Im always stumped as to HOW I present them. I designed this template to make just a gift like that presentable, fun and functional! Now everything being said-let me introduce you to the Lollipop Along ©! This was my template concept project. Every template design starts with an idea and actual project. Then I go on from there. Now these concpet samples are one’s that I don’t put much time and effort into these samples, as they are just a quick way to get my concept out into a tangible template! 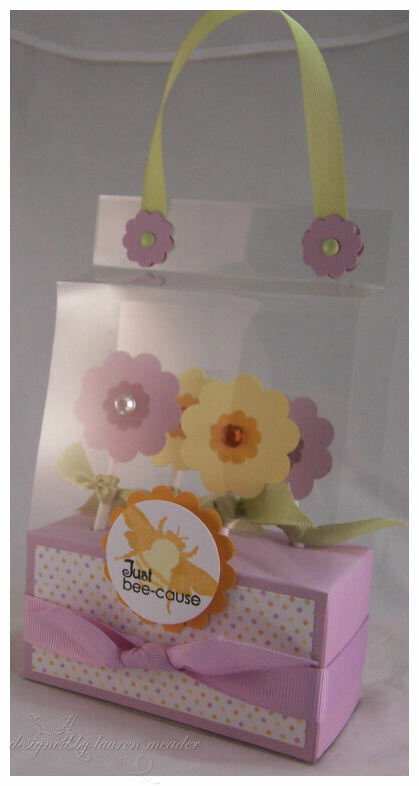 The flowers are made using the cuttlebug #1 flowers die cut. I stamped my Beautiful Blooms flower in the center, then popped out. They are covering the flat lollipops you buy at the store. I KNOW! I said home made lollipops, but we don’t always have time for that either. All you do is insert the sticks into the holes, and just use the handle to carry it to where ever you are going, to present it! I thought a sweet lil tag in the front would be cute. So I used honey bees & sentiments, since I wanted this to be similar to a paper garden! 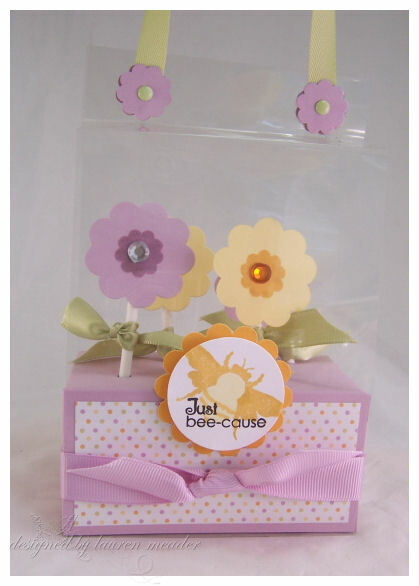 Just a cute way to present one of those everyday items you may like to give out. How cute would this be from the tooth fairy, or placed on the desks for some co-workers? Its super cute and sturdy. You can make it hold up to 6 pops. Depending on how you want them presented. You can reach right in the side, and grab a pop, or remove the ribbon – and the box bottom holder can slide out the side! OR undo the top closures and it can open from the top. You can adhere the bottom to the wrap base if you wish, or secure in there as I did with the ribbon. Its all about creative liberty, and depending on what you are putting inside. There is no right and wrong to the templates! Use them in a way that suits you and your creative style. You may be wondering HOW do I print my template on acetate? Well you don’t! You print it on your copy paper, and since you can see through it, you use it as your cutting/scoring guide for your acetate. Same thing with vellum. You can print direct on cardstock for your cover wrap if you wish. Even if your printer doesn’t take cardstock, you can still use all my templates! Just print onto copy paper, and layer it over your patterned paper or cardstock, and use it as a guide to cut, and score where necessary. Easy peasy. I like to use removable adhesive (just like what you most likely already use-it just says removable) to keep mine perfectly together as I go along. Throw the cut/scored copy paper template in the trash when done. You aren’t double cutting or printing if you layer it over what you want to use and use it at the same time. Now so you aren’t stuck on the name “Lollipop Along” let me share more with you! Well how about altering that bottom box, and making it into a bucket style holder (insteqad of a abox base) for some bath and body products? Maybe a pedicure kit. Instead of acetate, use vellum cardstock (or patterned paper/cardstock)! Yes! That is a fabulous idea!! How can you NOT feel happy looking at this? I took the bottom pattern from my template, and made it into a sturdy little box-ket (aka box/basket) to hold some super smelling foot scrub, a pumice stone, toe separators, nail files, chapstick and nailpolish from the Target $1 spot! Can you believe how cute this looks? That makes these gifts SOOOOOO affordable people! The files, toe separators and nail polish were in one kit for $1. Then the foot scrub and pumice stone were each a $1! So for $3 I packaged these contents for a FRACTION of ANY gift set you could actually buy. Given that my template cost is only $5 and you can use it forever, I didn’t put a price on the end gift-but one use pays for itself. 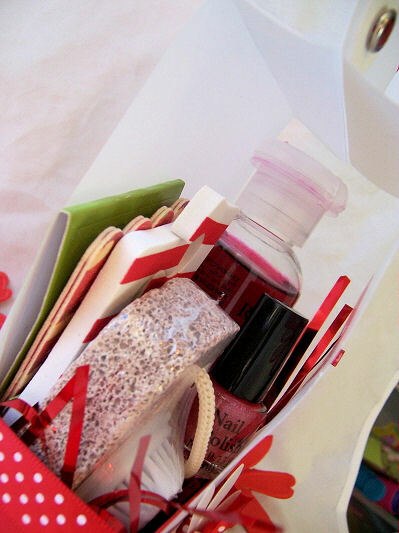 Even for $8 (cost with template included) this is a rockin gift for anyone who loves to be pampered! That doesn’t count the fact you can use the template in many ways, over & over!!!!!!!!!! Now, as you can see, I used vellum cardstock on my wrap instead of acetate! I used last months release set-Out of the box. Stamped in Pure Poppy ink, then dry embossed from the back-for some POP! 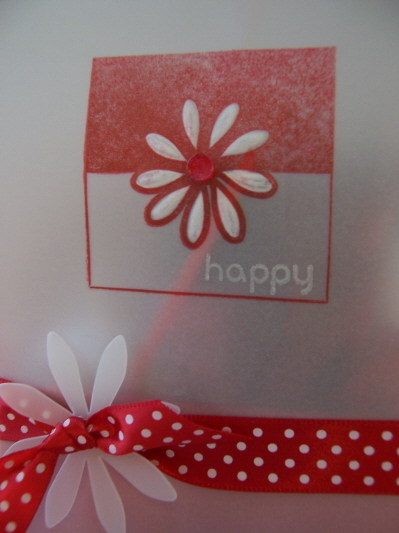 Stamped “happy” in white StazOn. AND YES! You should use a redline tape or scor-tape for these projects! The bottom holds this stuff no problem. 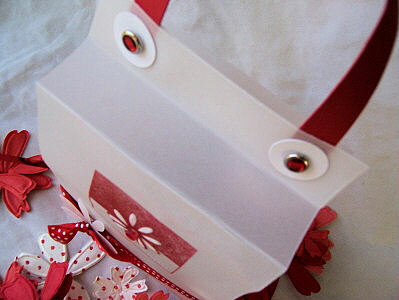 I like to use cardstock, or even ribbon for my handle. Depends on the weight of your items inside. I just secure it in place with brads! By adding cardstock or other accents you not only make it purty, but you hide the ugly backing of the brad! So there you have it! That is the peek of the day. I hope you are excited about this. I can’t wait to hear your thoughts. Now, just wait until you see my other projects with this template! WOW! I’m letting them get better as we go! LOL! Tomorrow I have a peek using my other template 😀 So, ya’ll come back now ya hear!